Last week, we dropped off the 2014 season small finds to the Hampshire County Council Museums Service headquarters to be conserved by their excellent team of conservators. The staff at Museums HQ were fantastic, taking time out of their busy morning schedules to show some of the students the conservation laboratories and the archaeology collection stores. Tilly was so inspired by her visit to Museums HQ that she has written a blog post describing the trip. Thank-you to Tilly for this post, and thank-you also to Amanda Sutherland and Claire Woodhead of the Conservation team and David Allen, the Keeper of Archaeology, for finding time to show us their places of work. It was a day like any other in the fun van, when all of a sudden our fabulous (the most correct/appropriate use of the word, if ever I saw one) leader, Nicole, after saving the life of a dear friend (a.k.a. my glasses) announced a minor detour to the wondrous, secret Headquarters of Hampshire County Council Museum Service, at Chilcomb House. The secretive HQ, disguised as a farm, held the secrets not only of conservation and archaeology stores, but also lovely people like Claire Woodhead and Dave Allen. The fun van gang (Darkaeology, Firedog, Fidgeter, Spoiler and Vicks) first encountered Claire Woodhead, a member of the conservation team, to whom we delivered our gifts of glass, metal and various other small finds (thanks Will, for ruining the surprise!). Claire was kind enough to satisfy our curiosity by showing us around her majestic conservation labs, where she carefully cleans and conserves the finds which we discover. If you have ever wondered what happens after the fun, mucky digging, then here is the place to be. 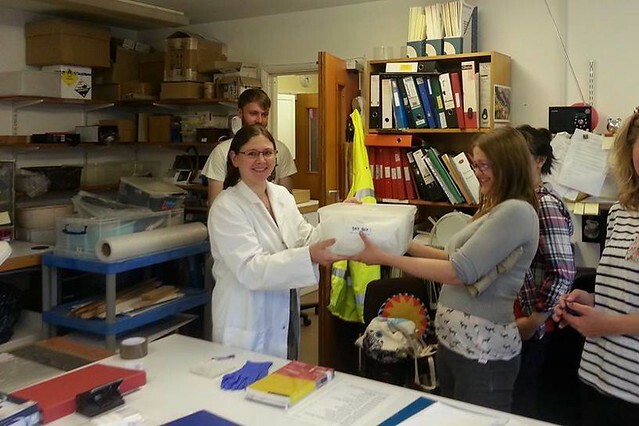 Tilly, Vicky, Nicole and Will handing over the small finds to Conservator, Claire Woodhead. Claire showed us around her abode, with the rather classic fume cupboard (looking slightly cooler than the ones you never ended up using in Chemistry! ), drying racks and various other cool things! She explained to us the transformation of conservation over the last few decades. Conservation methods have dramatically changed over time, from cleaning the living day lights out of the archaeology to now attempting to preserve the artefact by doing as little as possible to the object so as to preserve its significance. An example of this was an enamel mug from WWI, the exterior of which was clean and conserved, yet the interior had very little done to it at all in order to preserve the residues within (good call; Fosters has a new advert!). The conservation labs, not going to lie, were like a happy, comforting haven for all our lovely finds. However, despite looking like finds heaven, it is more like a finds limbo (a fab one at that), before being transferred into the archaeology stores. 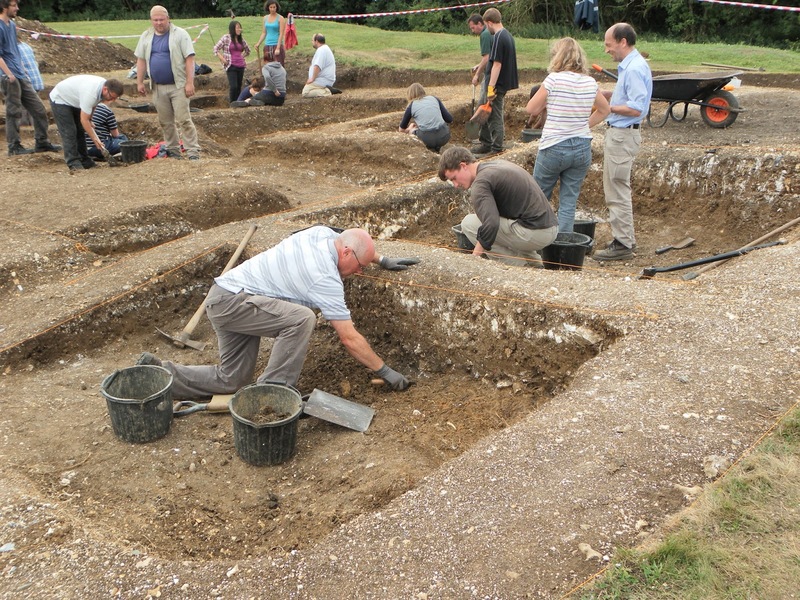 Dave Allen, Keeper of Archaeology (a hell of a title/job, we know! ), wearing a rather fantastic jumper, kindly showed us round one of the archaeology stores, where our beloved treasures would soon call home. It was like a fun toy store, but with less pogo sticks, but perhaps more exclamations like ‘OMG what is in this box?’. It certainly all looks like a lot of hard work, and we honestly couldn’t be more thankful or grateful of the amazing work that both Claire and Dave have done and are doing. 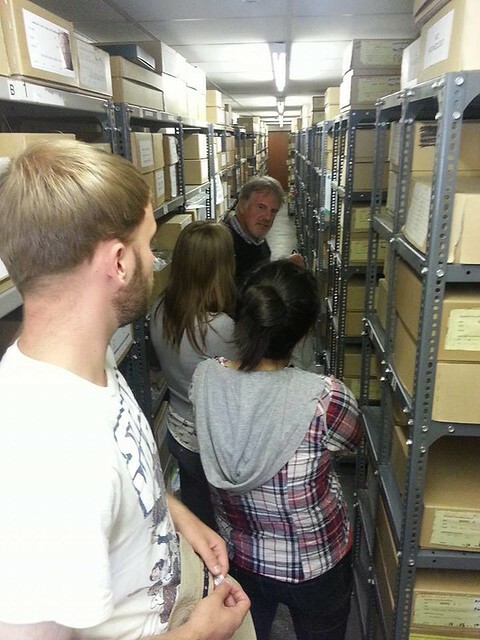 David Allen giving us a tour of the Archaeology Collections. We did not peruse the entirety of the collections as, lets face it we would have been there for years, and although they would have been incredible and fun, I fear Claire and Dave might kick us out! The weapons and costumes stores were amongst those which we did not feast our eager eyes on (much to the disappointment of all, particularly young Will, whose dreams of Tudor dresses and bayonets will remain in his head, unspoiled). But needless to say, Chilcomb house is more than a Tardis, far far more. It is a gem riddled with more gems. Live long and prosper. Let your finds live well. Thank you.